This article was written by a friend of mine, Michael Steven Smith. He is the co-host of the WBAI radio show “Law and Disorder” and sits on the Board of The Center for Constitutional Rights. Lynne Stewart is a friend. She used to practice law in New York City. I still do. I was in the courtroom with my wife Debby the afternoon of July l9th for her re-sentencing. The Judge John Koetl buried her alive. We should have seen it coming when he told her to take all the time she needed at the start when she spoke before the sentence was read. It didn’t matter what she said. He had already written his decision, which he read out loud for to a courtroom packed with supporters. It was well crafted. Bullet proof on appeal. He is smart and cautious. After about an hour into his pronouncement he came to the buried alive part. He prefaced it by citing the unprecedented 400 letters of support people had sent him, all of which he said he read. He noted Lynne’s three decades of service to the poor and the outcast. He stressed that she is a seventy-year-old breast cancer survivor with high blood pressure and other serious health problems. And then he laid it on her: 120 months. Everyone in the courthouse divided 120 by 12. He had given her a death sentence we all thought. She’ll never get out. He almost quadrupled the 28-month sentence he had originally pronounced. She had told him that 28 months was a horizon, that she had hope. But no more. Lynne’s granddaughter gasped. Then started sobbing. She kept crying even as Judge John Koetl kept reading. And reading. And reading. It was awful. The sentence was pitiless and cruel. How to understand it? It was on the occasion of a post-conviction prison visit that Lynne helped her client. She released his statement to Reuters press service announcing his withdrawal of support for a cease fire between his group and the Egyptian government. This was in violation of a Special Administrative Measure (SAMs) that Lynne had agreed to with the U.S. Government. She wasn’t supposed to be a medium for commincation between her client and the outside world. She should have challenged the constitutionality of the SAMs, she now realizes, and not just have violated them. In 2006 she was convicted and sentenced. The maximum was 30 years, but thanks to the superb legal work of National Lawyers Guild attorneys Elizabeth Fink and Sarah Kunstler and the outpouring of public support Judge Koetl gave her 28 months.The government appealed the sentence to their U.S. Court of Appeals. Game over. 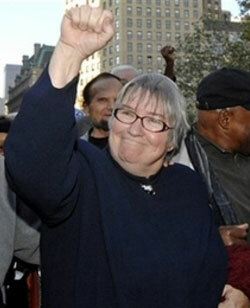 The selective prosecution of Lynne Stewart was accomplished. Judge John Walker, George W. Bush’s first cousin, sits on that court. His family made their fortune selling munitions during WWI. He wrote that the 28 months was “shockingly low.” Judge Koetl was given his orders. The seemingly kindly boyish looking jurist about whom it was said that he walks to work and looks after an elderly mother – not exactly a sadistic old lady killer – then reversed himself and on the same evidence nearly quadruped the sentence, putting a seventy-year-old grandmother on chemotherapy away for ten years and two years probation after that for good measure. This is much more than meanness. It is ideology. It appears clear that this is simply another example of the U.S. implementing uncruel punishments against the classic “enemy of the people.” It was Communism, now Terrorism. And so what? An otherwise remarkable citizen makes one mistake, and is then put in prison for a time period which is, for all intents and purposes, life. This isn’t new stuff, but it is equally as devastating even so. My best wishes and condolences to the family of Lynne Stewart. America should be deeply sorry for this serious travesty.